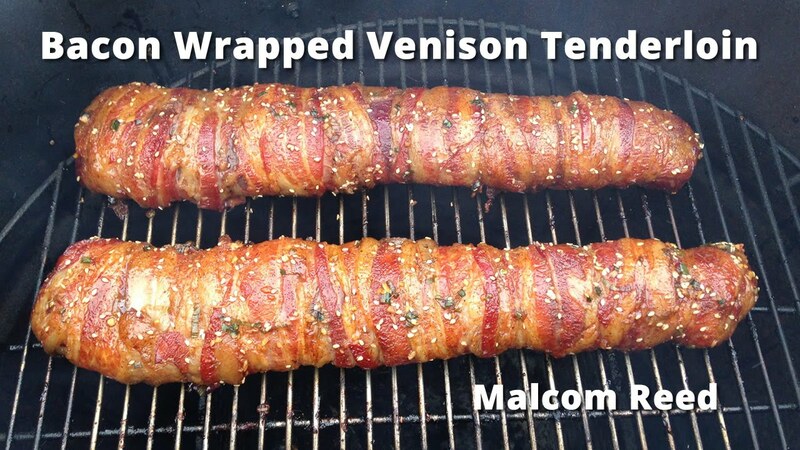 My father-in-law gave me a couple of bacon-wrapped tenderloins (!!!) as a gift a few weeks ago, and I decided to cook them up according to this method shown by Malcolm Reed (link below). It's got a Korean barbecue flair to it because of a glaze that you put on about 15 minutes before pulling it off the grill. Any unused glaze mixture makes good dipping juice for when you're eating as well. Just a very flavorful way to do up tenderloins, and if you follow the internal temperatures suggested (apply glaze at 125 F, pull off the grill at 130 F), it's cooked perfectly and not even close to overdone (which basically ruins venison IMO). I used my Weber kettle as a smoker, setting up an indirect heat fire with a single coal basket off to one side and the meat on the other. I added some charcoal about 1 hour into the cook to keep the temperature around 275, but it was a nasty cold, windy day, so you may not have to if you try it. And not too terribly difficult (If I can do it, you can do it, basically. Just have to find some venison tenderloins). I've been having leftovers of it, cold, for lunch this week, and still, wow! Last edited by NateWC; 05-02-2017, 02:25 PM. Have done this many times with back strap- excellent way to enjoy a great cut of meat.